This Healthy Stuffed Pepper Casserole with Cheddar is a great go-to meal for nights when you don’t really feel like cooking. 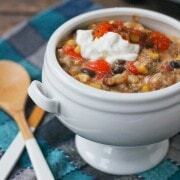 It’s easy to make, hearty, and tastes great! This might not be the prettiest meal in the world, but it is one of my absolute go-to meals. It’s a perfect meal for days when you’re exhausted. Hardly any prep time and you can do it early. It needs to bake for at least an hour and a half – which just so happens to be the time where I’m starting to go crazy and staring at the clock waiting for my husband to get home (aka the witching hour!). That might sound like a long baking time but the beauty of this is that you can do anything you want while it bakes. Make a side salad. Sit down, relax! Play with your kids. Do some yard work. Whatever you want. The only actual cooking in this dish aside from baking it (which is completely hands-off), is browning the meat and cooking the onions. Which takes less than 10 minutes. Once that is done, you just mix the rest of the ingredients together, tightly wrap it up with foil and bake. You have to stick around the house, you know, since the oven is on and all, but other than that you can do whatever your heart desires. And make sure to stir this every so often! Make sure to buy long-grain rice. The short grain will take longer to cook. My neighbor makes a version of this with orzo so you could try that if you wanted! 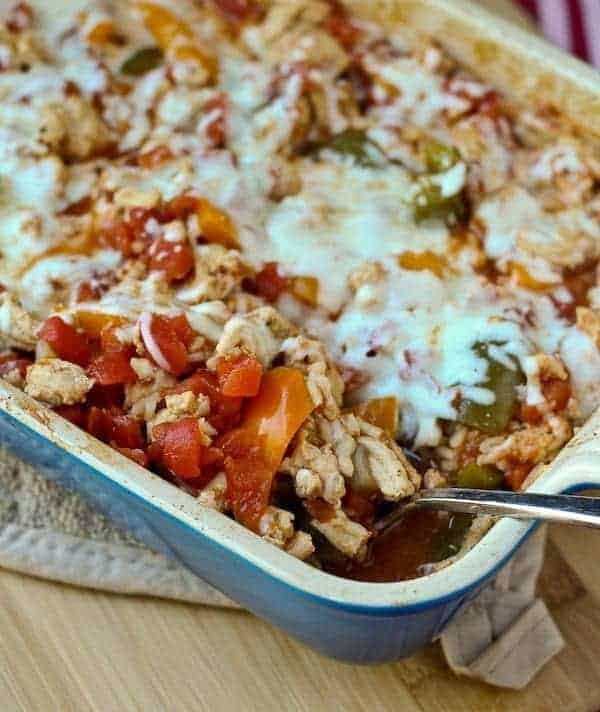 Feel free to substitute ground beef if you want a more traditional stuffed pepper flavor in this stuffed pepper casserole. I love ground turkey and I go for the extra lean stuff for this recipe because all the juice from the tomatoes makes it super juicy and flavorful. As with many of my recipes, I love to use extra sharp cheddar cheese on this stuffed pepper casserole. The bold flavor allows you to use less cheese leading to a lower calorie meal. I think when I photographed all I had was mozzarella – it was a milder flavor but still delicious. In a large high-sided skillet, add ground turkey and onions and season with salt and pepper. (I use a non-stick skillet. If you don’t, you might want to add a teaspoon or two of olive oil.) Cook, breaking up ground turkey, until turkey is cooked through and browned. 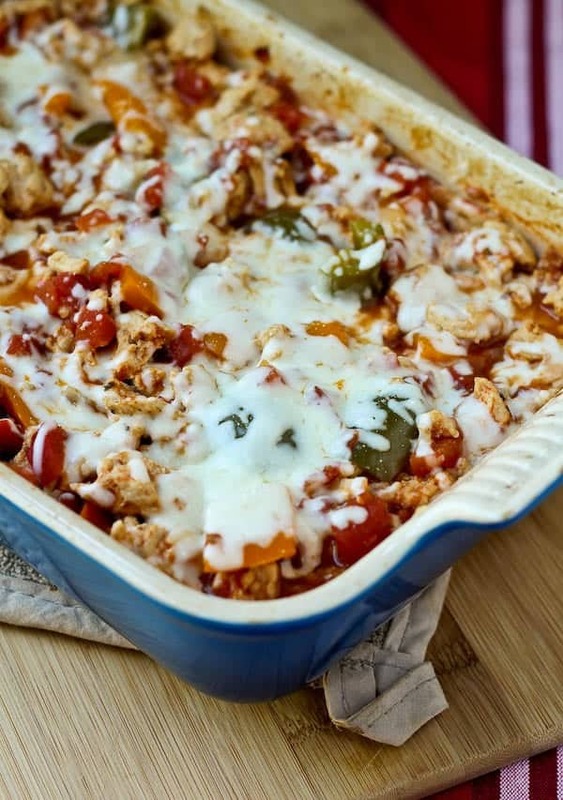 Add to a 9×13 casserole dish and add all other ingredients except cheese. Stir to combine. Cover tightly with foil. Bake for 75 minutes to 90 minutes or until rice is tender. Remove foil, add cheese and bake for about 5 minutes longer or until cheese is melted and bubbling. It is important to use long grain rice in this recipe. If you only have short grain, plan for an increased baking time to make sure the rice is tender. Using white rice will decrease cooking time. 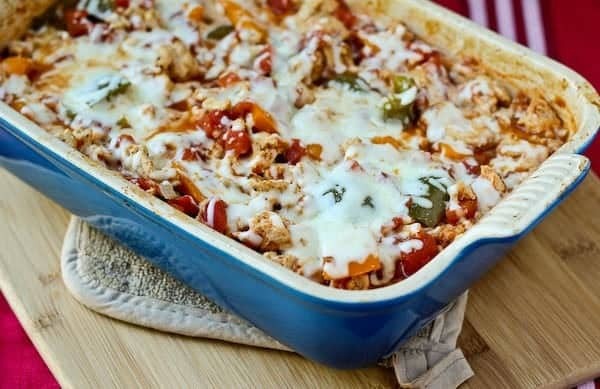 Verdict: I honestly love this healthy stuffed pepper casserole recipe. It’s so great paired with a salad – such an easy meal. Husband’s take: He never complains when I serve this! He loves that it is healthy and still really hearty and filling. Changes I would make: None are necessary. Sometimes I switch it up a little based on what I have in the house. I love it with mushrooms. Looking for more stuffed pepper recipes? Try Pizza Quinoa Stuffed Peppers, Southwestern Stuffed Mini Sweet Peppers, Southwestern Quinoa Stuffed Peppers. If you’re not feeling peppers, try this Easy Italian Vegetable Pasta Bake or Cheeseburger Macaroni Casserole. I made this on Sunday night and I’ve eaten it every day this week for dinner. I live alone and I’m always seeking out recipes that will keep for 4-5 days. This was a complete success! It tastes so good reheated and is filling but still healthy. 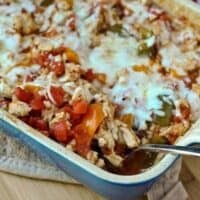 Also, I love stuffed peppers and this casserole is so much easier and more practical to make. Thanks for sharing, I’ll definitely be making this again! I’m so happy to hear you liked this recipe! Thank you for taking the time to come back and leave a comment, it means a lot to me! Hi! I just made this and it’s currently in the oven! I added sautéd kale and hemp seeds into it for extra nutrition. Excited to try! Here’s my question though. Does the recipe taste better by doing it this way as opppsed to just sautéing all the ingredients in a pan and making rice on the side? I could cook 1/2 cup of rice in my rice cooker in less than 20 minutes, so I’m just wondering if waiting 1.5 hours is worth it for a better taste or if it changes it that much? Thanks! You could definitely do that! It’s a hands off kind of thing for me, which I like…but I imagine the taste would be similar if you stirred cooked rice into the sauteed ingredients. :) Let me know if you try it! My fiancé and I are in full pre-wedding diet mode, and we LOVE this casserole! Do you happen to know the nutrition stats by chance? Even just calorie count per serving would be super helpful for tracking purposes. Thanks! Hi Jenny – congrats on the engagement! How exciting! I’m slowly adding nutrition information to all my recipes. It’s always a bit of an estimate, but I added it to the recipe card. I hope that helps! Good luck and congrats again! Has anyone doubled this recipe? I want to double it to make more but not sure how that will affect cooking times. Any advice or suggestions would be great. If you use a large enough pan (so that it’s not too deep), it should probably cook in a similar amount of time, maybe slightly longer. I haven’t tested it though, so let me know how it turns out if you try it! How would you make it with the orzo? Would you cook them first or no just dump in then bake? I haven’t tested it with orzo – it would significantly change this recipe since the rice takes a long time to cook, and it soaks up a lot of the liquid. If you experiment with it, let me know how it turns out! So happy to hear you liked this! Thanks for taking the time to leave a comment! I think this would freeze really well! Let us know if you try it! Do you think you could use instant brown rice and just lessen the cook time? It could work! I would give the peppers a quick saute with the meat, otherwise they might not cook through in the time the rice takes to cook. I haven’t tried it that way so I make no promises, but I’d love to hear back from you if you try it! Just wondering, do you think the turkey could be swapped out for chicken? My husband and I are more into chicken than turkey. We aren’t wondering which one would be healthier, but if it would still taste good. It would taste great! That would absolutely work. :) Enjoy! This was very good I had to use a little more salt and pepper. I will definitely make it again. So glad you liked it! Thank you for coming back to leave your feedback, I really appreciate it! Did you make this with crushed tomatoes or diced tomatoes? Looks like diced in the picture but says crushed in the recipe. Crushed is best! I might have used petite diced for the photos, I mix it up sometimes depending on what I have in my pantry (you caught me!). Crushed will yield the best result though, if you have them. You might be seeing a few red bell peppers too – I think I used a mix of three different colors. I made this for dinner tonight and it was fabulous! Mine took longer than the 90 minutes so I was glad I started early. It was totally worth the wait! Next time I’ll prep it the day before and let the rice soften to reduce the cooking time. I served it with garlic roasted cauliflower steaks and it was a healthy, delicious meal. Thanks!! So glad you liked this recipe! Smart to soak it overnight…and those cauliflower steaks sound divine! So happy to hear you liked it! Thank you for taking the time to come back and leave a comment, means a lot to me! 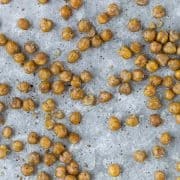 Question about the rice, how does it soften up in the oven without any water? Just worried it might come out crunchy. Thanks! It cooks in the juice of the tomatoes and steam (cook it covered). It does take time though! You could add the Tomatoes, Rice, Peppers to the pot you browned your meat in…cook for a few minutes o stove..then build your Casserole. Wouldn’t take so much basking time! Love how you keps all the flavor but took all the work out of a favorite dish! This looks good enough to eat off of all week…but I bet it wouldn’t last very long in my house! YUM! Looks amazing Rachel!! My kids would love this!!! Healthy and easy – I am IN! All busy moms need recipes like this! Can’t wait to make it! I love your idea of using mushrooms in this, too! YUM! 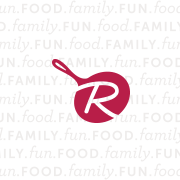 We’re simpatico today with our recipe sharing. Your version looks supremely easy! I think Amy might be onto something by using leftover turkey. And yes, always sharp cheese! Sure looks good to me! This might even work using leftover turkey from Thanksgiving. Either way, I love it! I need to have some make-ahead meals for later this week. And I have everything in the house already to make this! What luck! I love low maintenance dishes like these! Especially when they’re loaded with all that delicious looking cheese. :) And that’s a great tip on the long-grain rice! I never thought about that.